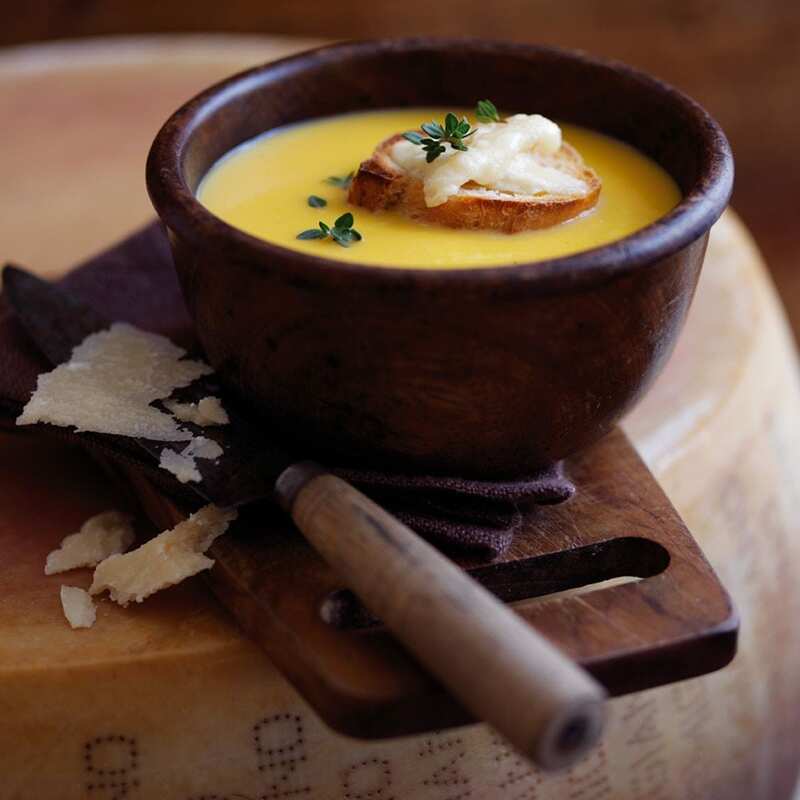 Pumpkin and Parmesan Soup is a first course perfect to warm up the cold autumn period. This soup is a light, fast and at the same time really tasty dish. Cut the crust of Parmigiano Reggiano cheese into rough pieces and keep it aside, then grate the rest of the cheese. Melt the butter in a pot, add the onion and cook for about three minutes until the onion becomes soft, of a light brown color. Then add the pumpkin, vegetable broth, and the Parmesan crust. Bring to a boil, then lower the flame and allow to cook for about 20 minutes until the pumpkin becomes softer. Remove the crust from the pot, transfer the soup to a blender or a robot and add the grated cheese (keeping aside about 25 g to garnish the dish at the end). Blend the soup until it is completely smooth and velvety. Put it back in the pan, add the milk and mix. Adjust salt and pepper. In the meantime, toast the slices of bread, dust the remaining Parmesan Reggiano on the surface and grate them until the cheese is loose. Serve the soup in bowls and complete with a slice of toast, a sprinkle of parsley or fresh thyme and a ground of black pepper.